I love accumulating airline miles. e-Miles offers one of the easiest methods to earn free airline miles. 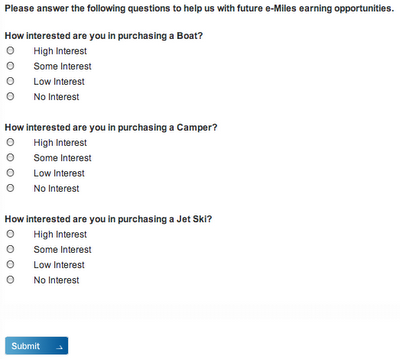 You earn miles simply by viewing short marketing messages and answering a few questions afterwards. advertisements, and you will quickly start to earn e-Miles miles which can be deposited into various frequent flyer programs, hotel programs and more. When you login, you will see e-Miles earning opportunities, which tell you how many miles you can earn with each program. With most programs you will earn 5 e-Miles just for viewing an advertisement. You can earn more miles for signing up for some programs with your spam email, or making a purchase. 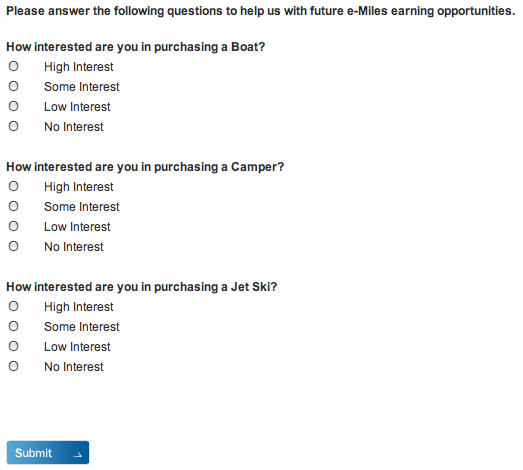 No purchase is necessary to earn miles and I have yet to see an advertisement for a product I’ve been interested in buying. Once you have earned 500 e-Miles miles, you can deposit them into your preferred frequent flyer or sponsor account. See the e-Miles FAQ here and start earning miles today.